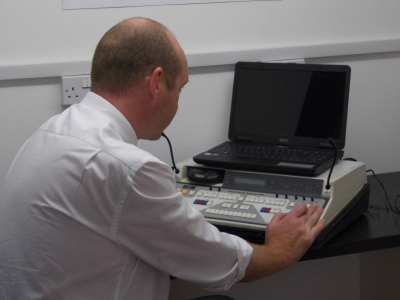 St John's Hearing Aid Centre provide two different systems of private ear wax removal. These can be carried out at our branches in Grange-over-Sands and Edinburgh, or alternatively, via our Mobile Ear Wax Removal service in the comfort of your own home. The type of removal can be based on personal preference (some people don't like the noise of microsuction) or the technician may decide which is best based on your history. For your comfort and safety, our experienced and trained technicians are all HCPC registered. High-magnification binocular glasses are used to clearly visualise the ear wax in the ear canal and gentle suction with a low pressure suction machine and fine sterile probe is used to removed the wax. The procedure usually takes between 20 to 30 minutes to perform, depending on the amount and type of of ear wax, how deep the ear wax is inside the ear canal,and whether you are having one or both ears treated. Ear irrigation replaces the old technique of syringing and uses an electronic ear irrigation machine to remove ear wax. This machine contains a storage reservoir unit for water and a hand held nozzle which pumps water into the ear canal at a controlled and steady rate in an attempt to dislodge and flush out ear wax. Once excessive or impacted wax has been identified as a problem, you will be required to use ear drops for 7-10 days to soften impacted wax and then our fully qualified, trained technicians can remove the wax using the latest gentle irrigation technique. It is a gentle procedure and removes unimpacted wax effectively. All our technicians are HCPC registered, with many years of experience and training. We offer competitively priced private wax removal at our premises or within your own home. Please contact us for our latest charges.